All aboard for Port Dover! 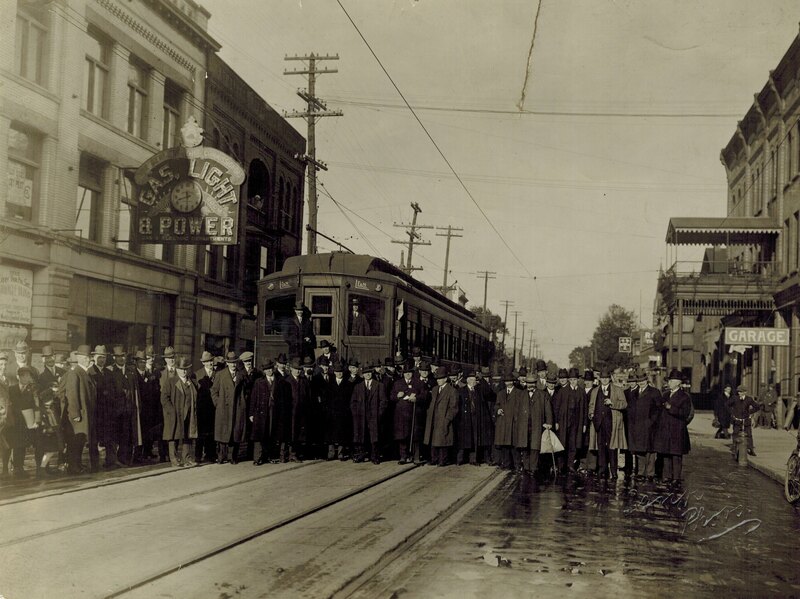 Ninety-six years ago, members of the Kitchener Manufacturers’ Association (KMA) gathered for an 8:30am departure on the ‘Elmira to Erie’ train at the offices of the Kitchener & Waterloo Street Railway. They traveled aboard “one of the elegant cars of the Lake Erie & Northern Railway” according to the 16 Oct 1917 edition of the Kitchener Daily Telegraph. Their mission, which was to inspect the harbour at Port Dover and discuss its possible development as a freight import terminal, was undertaken with much enthusiasm and ceremony. However, in the end, the project was never realized. For a long time, this photograph, from the Waterloo Historical Society collection, was the object of much mystery and debate. The appearance of the name “Berlin” over top of the Gas Light & Power sign seemed to suggest a pre-1916 timeframe. Working with local railway expert, George Roth, author of Steel wheels along the Grand, I did a bit of digging. Based on the information George compiled, I was able to find articles in the 16-17 Oct 1917 editions of the Kitchener Daily Telegraph and News Record which pointed to the KMA trip. It wasn’t easy as we weren’t sure if the men were dressed for the spring or fall and debated the amount and quality of foliage on the trees in the background. When did the name change from Berlin to Kitchener on the clock sign? Well, that’s another mystery for another day!